As a teenager, life can seem pretty unfair and full of questions with no good answers. The world is not designed for teenagers. It's a stage of life where you are too old to do some things and too young to do others. The transition to becoming an adult can be quite challenging. If you're a teenager who wants to go beyond a standard education and learn about who you are and how you can build fulfilling friendships, Tan-Ju is for you. You will live together with an international group of teenagers and have the chance to make lifelong friendships that extend all over the world. You will be able to express your feelings, to find out what you like and to learn to create a beautiful world around you. 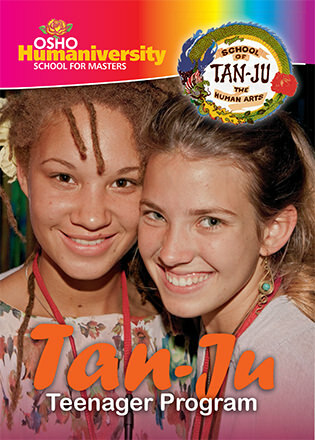 Tan-Ju offers an alternative way of living and learning in a warm, safe and supportive environment. As well as accepting and loving yourself more, as a Tan-Ju you'll also learn the responsibilities of making your bed, cleaning your house, creating projects together and becoming sensitive to your own and others' feelings. The Tan-Ju program is a school of friendship, acceptance and just simply being the best you can be. Being a teenager should be the greatest time of your life! Friendship Everything we do here at the Humaniversity is geared towards friendship – living together, hanging out together, working together and doing meditations together. It doesn't matter what you do; you'll always have people around you. You will learn how to take care of yourself and your friends and family, how to express yourself, how to work together as a team and how to be creative together. By working out your difficulties with each other, you will be able to trust and open your heart and create everlasting friendships. Creativity You will be able to explore and show who you are through painting, cooking, singing, football, swimming, theater, dancing, DJ'ing and hosting Tan-Ju events for the Humaniversity community. In the summer we may create a theater show where everyone becomes a star by performing a dance, poem, sketch or song. Meditation As a teenager you may experience feelings of insecurity, fear and isolation, and you may not know how to deal with them. Meditation is a great way to relax and get more confident about who you are, what you think and what you feel. You will learn and practice Social Meditations, which will guide you to explore your feelings actively with your friends. Personal Power In Tan-Ju we encourage you to take a position for your life. During sessions you will have opportunities to express your anger and frustration. Then we'll show you how to transform these feelings to create the positive things that you want in life. You will practice martial arts, archery and encounter (including the AUM Meditation) to increase your personal power, coordination, self-confidence and ability to communicate clearly. Recreation We will practice the art of hanging out and enjoying each other's company. This will include sports, games, going for walks together, jogging, massage and relaxing in the sauna. We will also go on outings together to enjoy the beach, a challenge park, a restaurant or a movie. Responsibility As a Tan-Ju you will learn to take pride in caring for your surroundings and each other. You will wash your dishes, make your bed and clean your house. As you take care of your environment and your friends more and more, your strength and self-confidence will grow. You will be able to establish deep and loving relationships because you will find yourself giving naturally and contributing to others. At the end of the program you will be proud to be a Tan-Ju and sad to leave this beautiful family. The age range of Tan-Ju is from 14 to 20 years. For younger teens we recommend the Parents & Kids Camp (held over Easter and Christmas). Tan-Ju is held every year for one month from the middle of July to the middle of August and in the winter from December 22 to January 1. Tan-Ju: Teenage School of the Human Arts! Tan-Ju is a school for teenagers from all over the world. You will learn to take care of each other, increase your self-confidence, find yourself contributing to the group and supporting one another to become loving friends. Enjoy martial arts, parties, theater, outings and expressing your feelings. 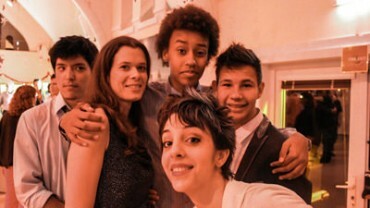 Tan-Ju is a special gang of young and lively teenagers who want to make this world a better place to live in. Tan-Ju is a school for teenagers from all over the world. Being a teenager and the transition to becoming a grown-up can be challenging. 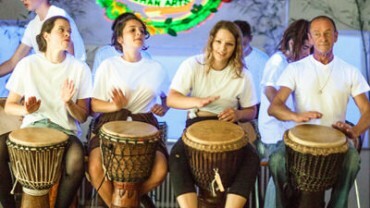 Tan-Ju is a unique experience where teenagers learn how to relate to their emotions, express themselves with honesty and become close friends with each other. Live and learn together in the warm environment of the Humaniversity family.